Usually I would add in salt or seasoning as well, (which I highly recommend) as it’s a pretty nominal amount (allow maybe 20 cents) and can really improve the taste. Moroccan spice, or salt and pepper, or even a cup of old red wine if you have it lying about is great. The reason I left this out was because I wanted to use some of it for baby food, so I’ll be adding seasoning as I reheat frozen meals before serving instead. The meat is the base flavour, and also a great source of iron. $5 per kg is usually a good bench mark for red meat/bones. 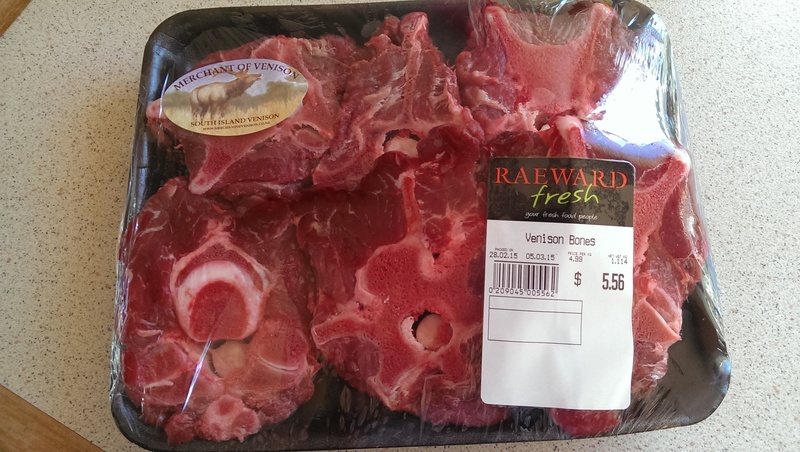 These come from Raeward Fresh, our local fruit/veg/meat store and they have a great amount of meat on each bone. Other cheap options are beef bones, pork hock, gravy beef or chicken necks/bones (although these are a bit fiddly getting the meat off). 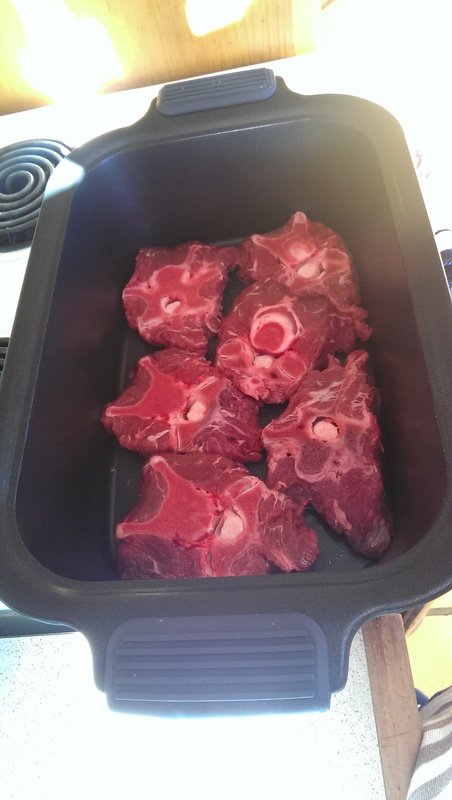 Bones are great for slow cooking, as after a few hours the meat will just fall off and you can just fish the bones out. 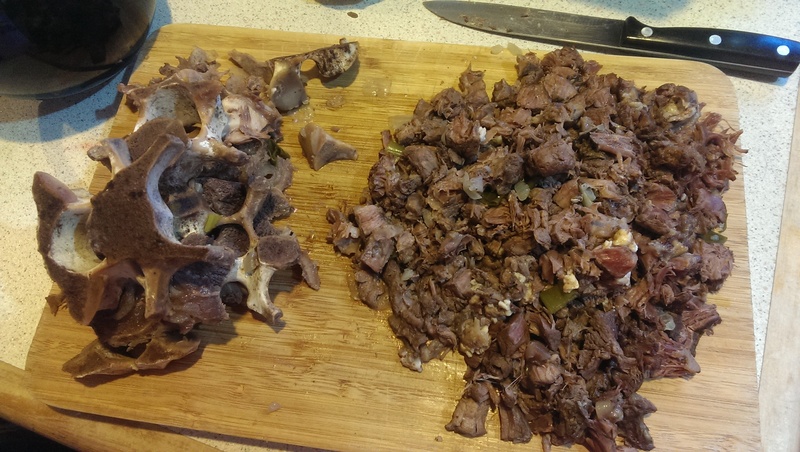 They also give you all the extra goodness from the marrow, which you don’t otherwise get with steak or meat chunks. It just so happened that my meat fitted PERFECTLY in the base of my slow cooker. 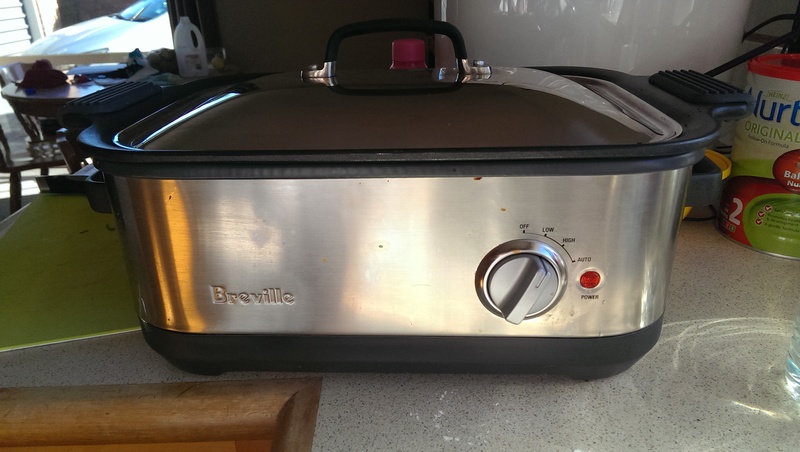 We bought the buffet size with a removable searing pan. 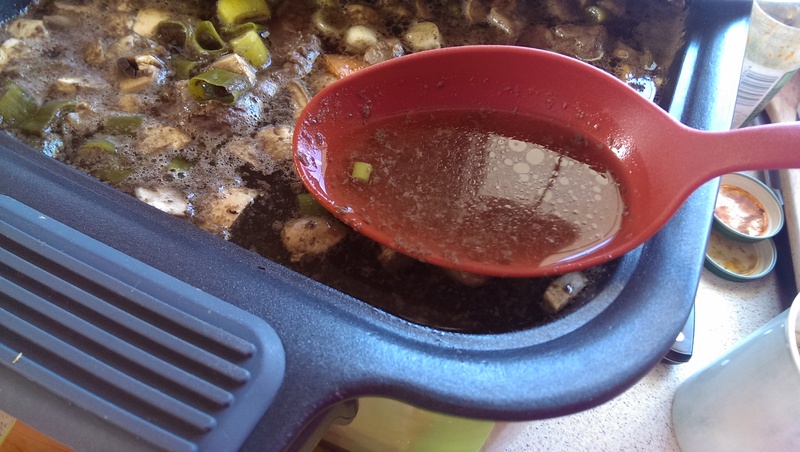 As you need to brown your meat first, I’ve found this invaluable as it saves so much time and is one less dish to wash. Once it’s all browned up, you just stick it back in the slow cooker and set to low. 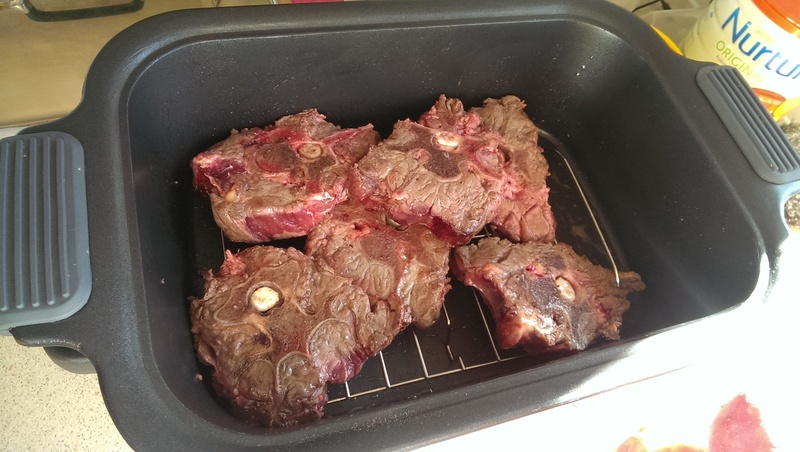 As the bones are uneven shapes, it’s difficult to brown them completely, but just get them as good as you can and put them back in the slow cooker. I put them on top of the metal rack as it makes it easier to mix the veges under them and fish them out at the end, but if you have a good one you shouldn’t HAVE to as nothing will burn. 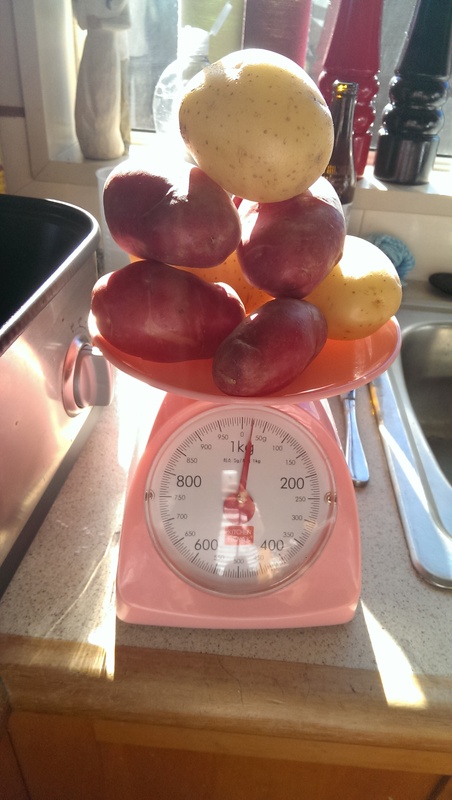 This is what approx 1 kg of potatoes looks like! 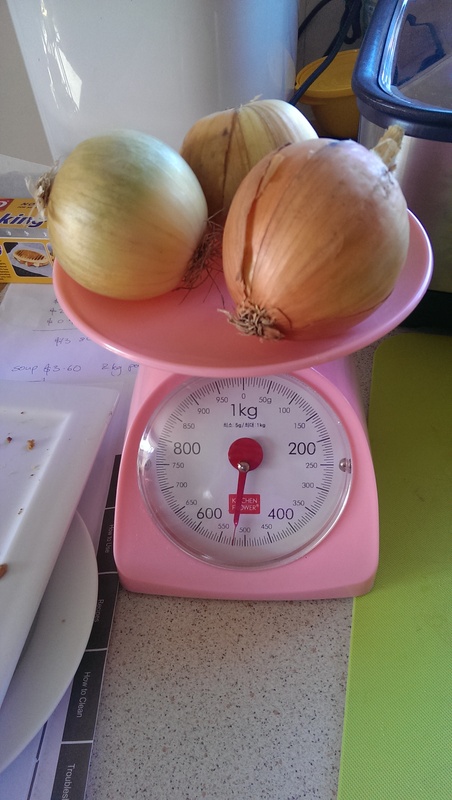 As I buy mine in 5-10kg packs I like to weigh as I go to help figure out the price of what I’m actually using. 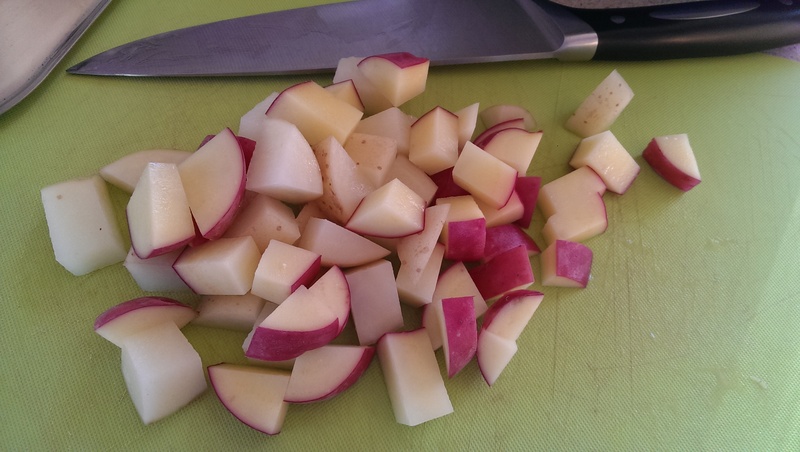 Since I’m cooking in bulk I’ve cut the potatoes fairly small. They would cook all the way through even if they were fairly big as they stay in the slow cooker most of the day, but the reason they need to be small is just so you can cram as much food in the slow cooker as possible. The meat is always your most expensive item, so the idea is to make that meat go as FAR as possible by bulking it up with cheaper items. 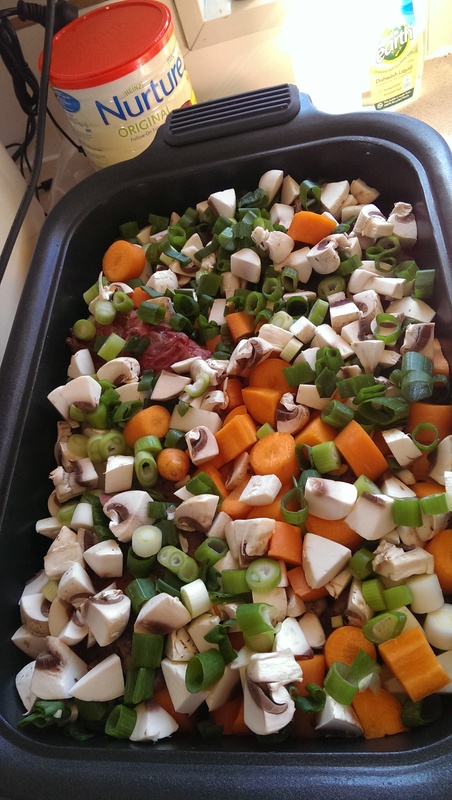 For stews it’s good to incorporate things with a nice flavour and texture that add something to it. Potatoes are great for bulking it out, but you can easily have too many. 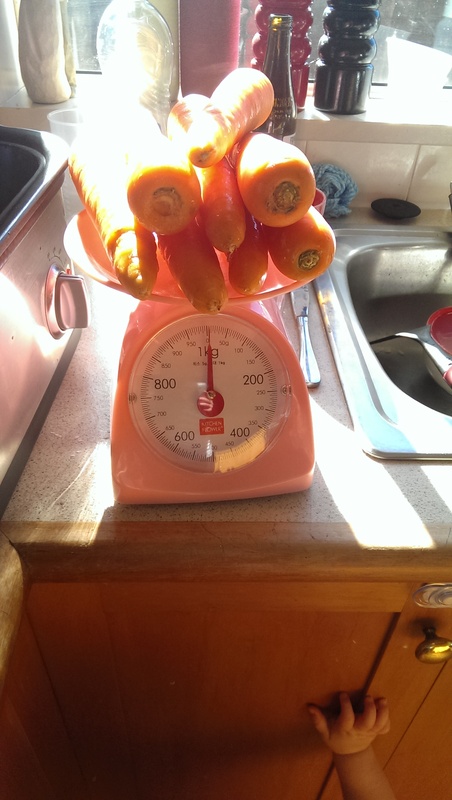 Carrots help to give a bit of balance, and a few different vitamins. 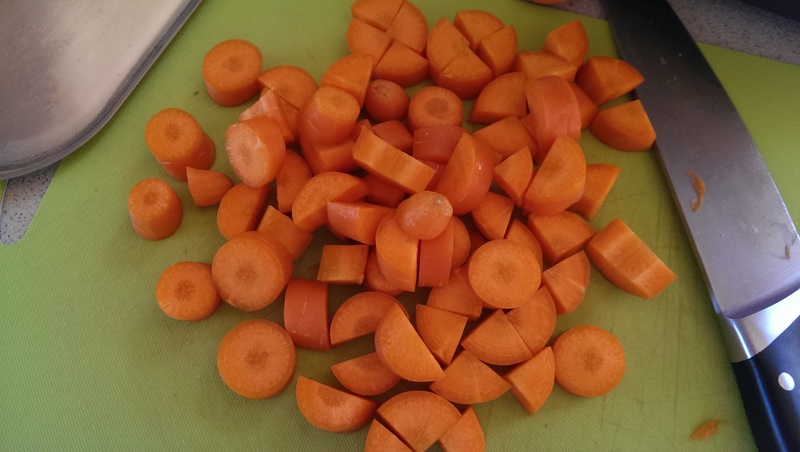 Again, cut the carrots chunky but fairly small so you can fit as much in as possible. Any circles that are too big can be sliced in half, or even quarters. The mushrooms! I find it so hard to believe how much these cost compared to the other items, but they do add that little something extra. Other additions you could make are spinach, pumpkin, garlic, or any other appropriate veges you find on clearance. 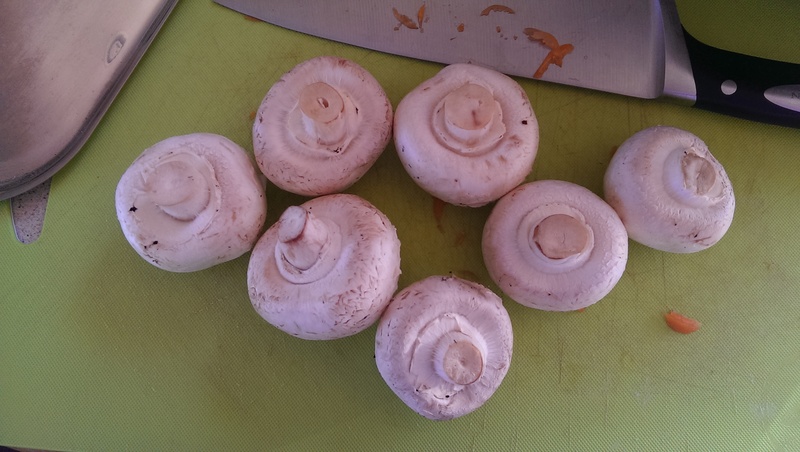 It doesn’t really matter how you cut these as they reduce in size so much while cooking. If you want them to stay plump and squishy, only add them in the last hour or so, but I’m putting mine in at the beginning so they can have more of a chance to seep their flavour into everything else. 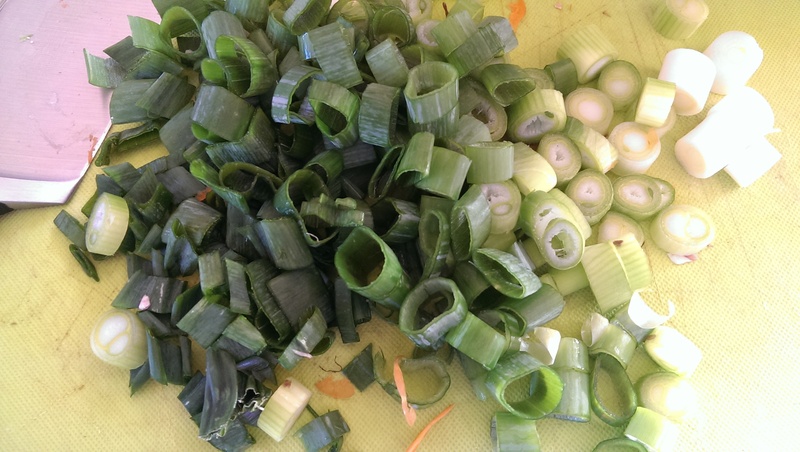 I sliced up just under half a bunch of spring onion – or two stalks, and put it on top. I find spring onions give stews a bit of “depth” in flavour. 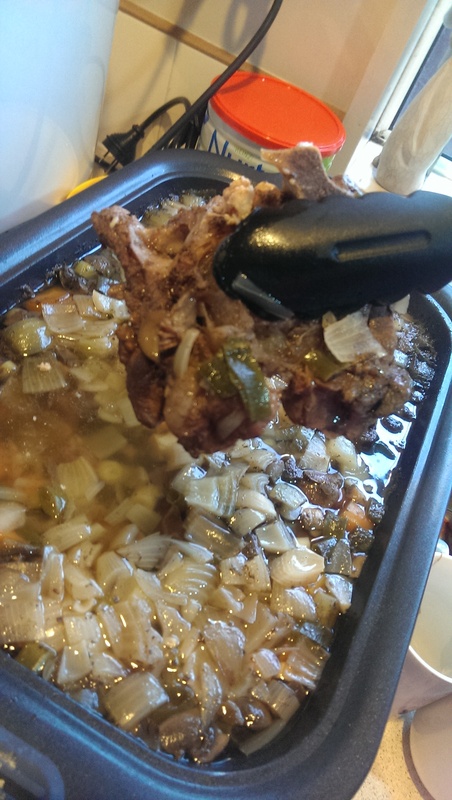 Here it is all together – you can even see some meat peeking through! The only thing that isn’t in here yet is the onion, which I will add after things have reduced a bit. 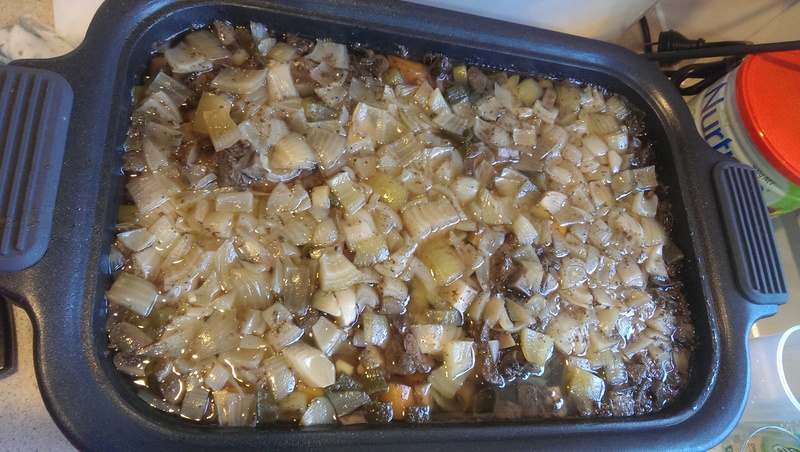 Once you’ve put everything in, fill with water a cup at a time, until it’s pretty much covered (It doesn’t matter if some of it’s sticking out the top as it will reduce over time), and set to cook on low. This is my favourite stage – where you walk away. 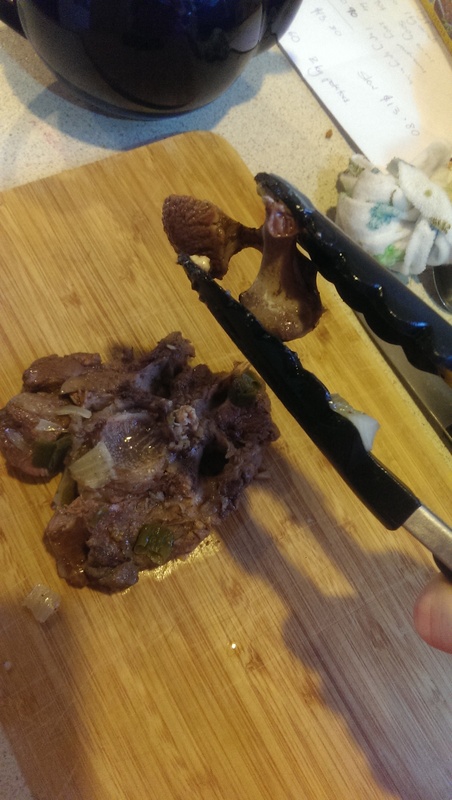 So far there should be very few dishes to do – A pair of tongs or whatever you’ve used for turning the meat when you cooked it, a chopping board and a knife. 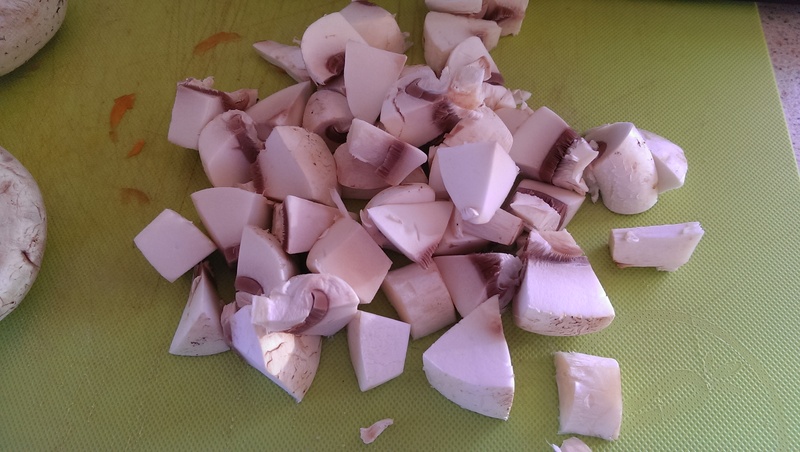 I don’t peel any of my veges in stews, as most of the nutrients sit just under the skin so you can very easily throw out the best part if you do that!! 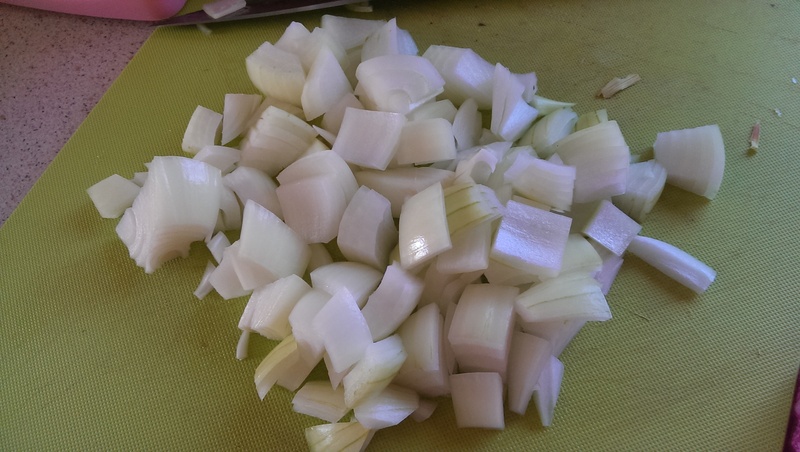 Here are my onions, I diced them up early so I don’t have to wash my dishes twice. Nice and small chunks, as we’re short on space!! 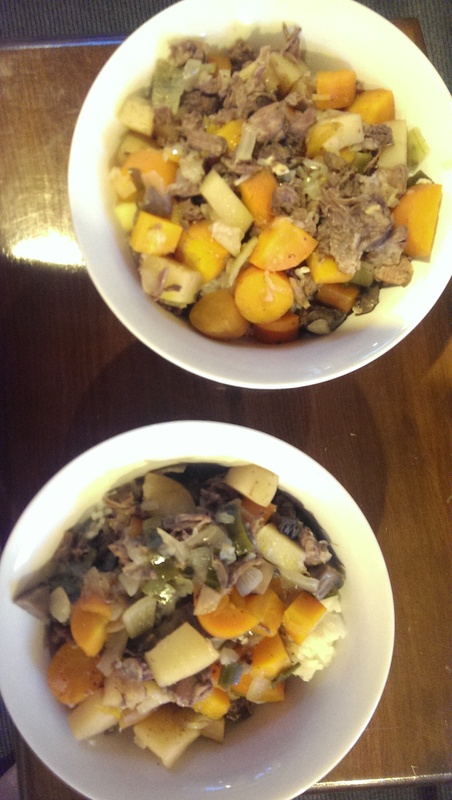 After several hours stewing away it should look like this. Things have reduced down a bit, and the water is now a rich and beautiful stock! Now is when you can add in your extras (in my case onions) and leave it going for another few hours. 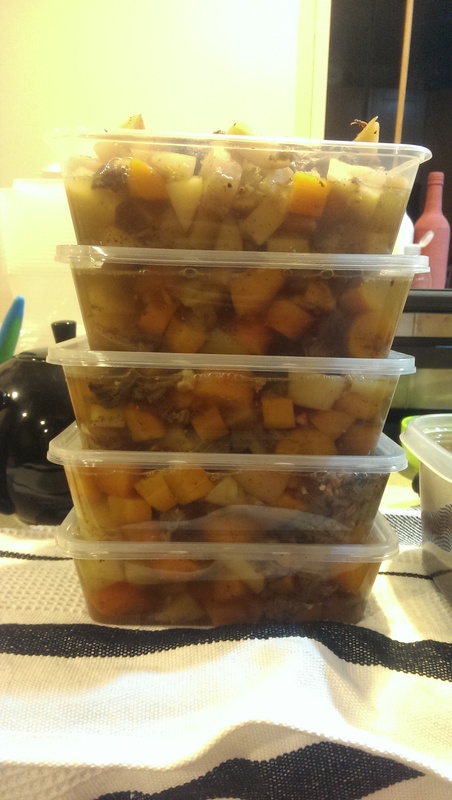 It’s not really necessary to mess around with stews once they’re cooking, but if you want to make things as cheap as possible you want to pack in as much as possible!! You have to be fairly careful when fishing your bones out, as they are so tender they will just fall to pieces. I found a few little pieces that I’d missed when sifting through a second time!! They come off so clean! Put the whole thing on a chopping board and pull the meat away from the bone with a fork or knife. I got an impressive amount of meat off my bones! Here it all is!! Once you’ve gotten it all off, return it to the slow cooker to mix through, then serve up on rice and season how you want. It needed a little salt and pepper, but was delicious!! This gave us the two serves above, and then these 5 containers (two serves each) to pop in the freezer!! 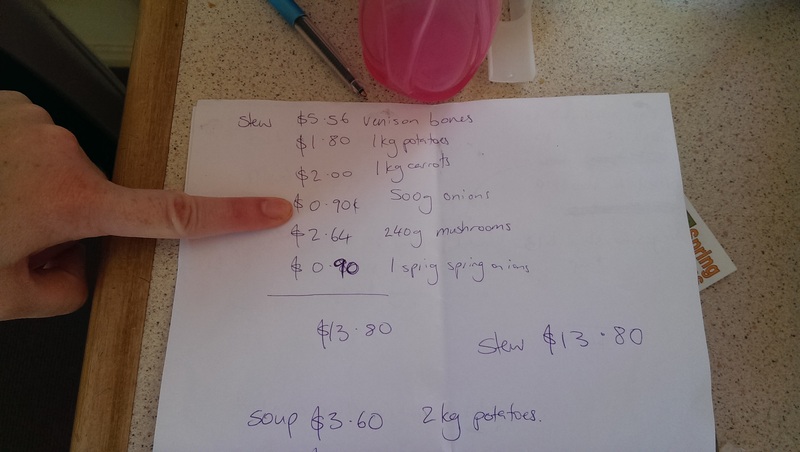 That’s one day with fairly low-effort cooking to feed us for 6 nights! 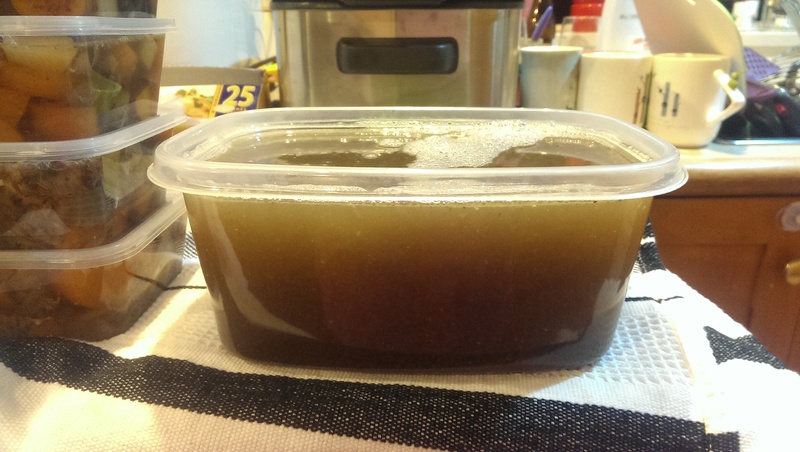 We also got a massive container of stock to use for our next stew! Since we had so much stock I decided to freeze some of it. 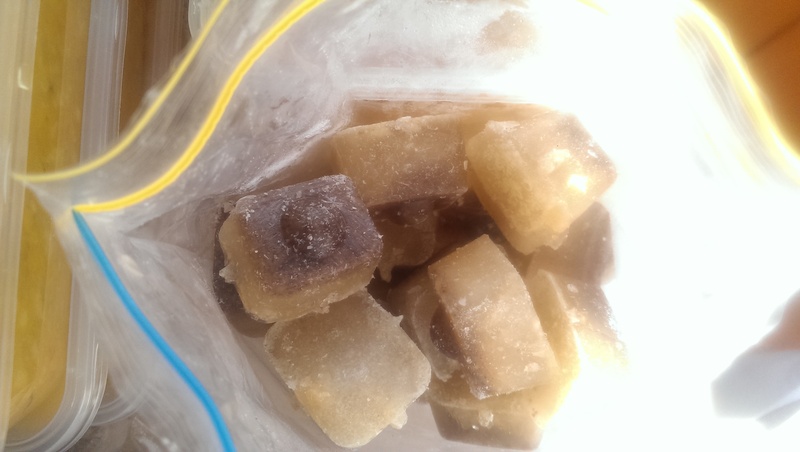 Ice cubes in plastic bags is a pretty space efficient way to keep them in your freezer! Since I got a whole extra container of stew than I thought I’d get, I mulched this lot up for baby food! This is my little Tupperware Turbo Chef (a super compact little buddy which I use most days!!) 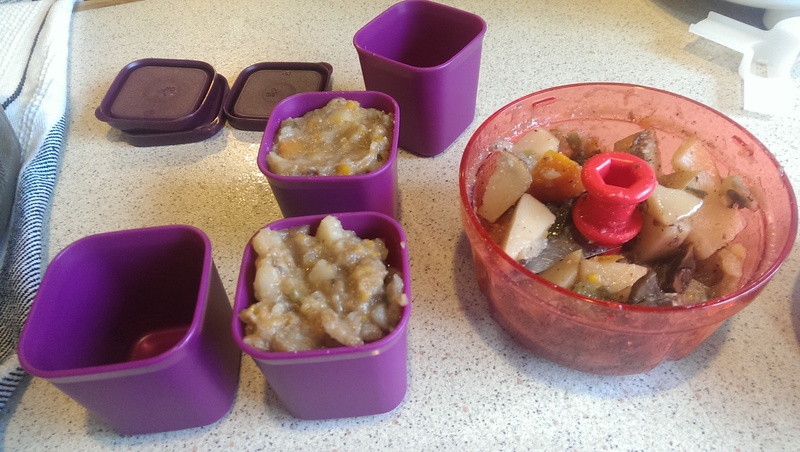 and I’m using my little Tupperware Steamer containers as they’re the perfect size for baby-portions! If you would like a Tupperware Party to get some great kitchen equipment, I travel around the South Island, so please check out my Facebook page and contact me here. To see another great frugal recipe click here.